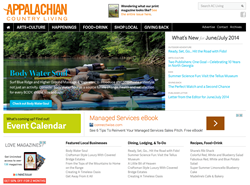 Atlanta's premier web design company, Black Bear Design, announces the launch of a new online publication– Appalachian Country Living magazine at ACLivingmagazine.com. We (Black Bear Design) are very excited to help Appalachian Country Living magazine expand to a new online platform! Atlanta's premier web design company, Black Bear Design, announces the launch of a new online publication– Appalachian Country Living magazine at ACLivingmagazine.com. This in-depth site puts the spotlight on the Appalachian Country Lifestyle with plenty of visual and editorial excitement. The magazine-formatted site will feature many articles about the different cultural details of the region. Appalachian Country Living magazine has served North Georgia for 10 years with articles about the history, arts, food and people of the region. The magazine also covers broader stories from local events and entertainment to home decorating to business. AC Living is a free magazine available at businesses and high traffic centers throughout the north Georgia area. The company also gives back to the communities it serves through supporting the “Shop Local” movement and by showcasing our non-profit organizations. Black Bear Design stays ahead of the curve in web design by employing top quality experts who continue to keep up with the latest web developments. One of the biggest web design issues in recent years has been whether or not websites should be designed primarily for mobile users or at least with mobile users in mind. Black Bear Design provides solutions or mobile optimization, such as Responsive Web Design. Another big concern with website owners is inbound marketing, which is a low cost form of marketing that relies on content that attracts followers rather than on interruptive advertising. Black Bear Design is experienced in helping businesses find the right avenues for marketing, including solutions for content development, SEO and social media interactivity. AC Living magazine is one of many innovative projects developed by Black Bear Design. Several samples of recent web design work can be found on Black Bear Design's website. The company is capable of crafting any type of website from basic to state of the art. The design team includes graphic artists, web designers and marketing experts. One of the modern solutions for marketing websites offered by the team includes pay-per-click marketing. It also offers website maintenance and branding. While many people turn to creating their own websites for free using WordPress, they may be missing out on discovering all the tools that can enhance a WordPress site or any other site. The Black Bear Design team has worked with a full range of websites, from basic to comprehensive. The company understands how to build a website of any magnitude, and follows an efficient design process that keeps clients involved through a series of steps to prevent miscommunication. One of the biggest problems that clients of web design companies have faced that has been very costly has been poor communication with tech personnel. Black Bear Design executes a process with built-in customer feedback that ensures projects will be completed properly and on schedule. Another problem that web owners have faced is working with companies that only provide certain services, whereas Blear Bear provides services for every facet of web design. The team focuses on developing high quality websites that are thoroughly tested before being launched to the public. The process involves comprehensive communication with the site owner before the project is even developed. The company provides its expertise in estimating and auditing in the planning stages, along with a detailed plan before the client agrees to the project. The projects are flexible enough to allow changes through the development stage. The most important ingredients Black Bear Design has brought to its pool of web design clients have been fun and creativity. The company can also provide large amounts of data about a website. The key to the company's leadership in Atlanta web design has been its ability to meet deadlines and provide customized quality.